Introducing truSculpt® 3D, a new dimension in non-surgical body sculpting. 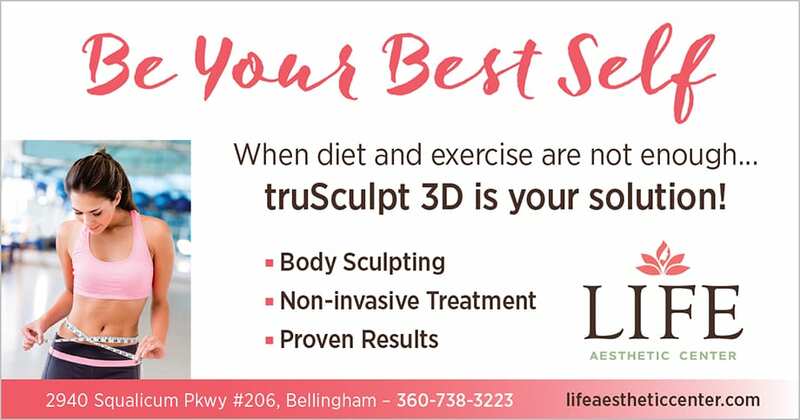 LIFE Aesthetic Center is proud to be the only Whatcom County provider to offer truSculpt® 3D. This body contouring treatment offers a comfortable, non-surgical option to improve overall body contours by reducing fat and tightening skin tissue. truSculpt® 3D uses radiofrequency energy to heat deep layers of skin and fat to improve the look and contour of trouble zones. The non-surgical solution is ideal for patients who are close to their ideal weight, but have targeted areas which don’t respond to diet and exercise. By increasing the depth and heat patients are seeing significantly more fat reduction and skin tightening. Studies show a 24% fat reduction after a single, 1-hour treatment. truSculpt® 3D reduces fat and improves skin appearance on the back of the arms, bra line, flanks, abdomen and thighs. truSculpt® 3D is comfortable and requires no anesthetic. During your treatment, a hand piece that emits radiofrequency energy is placed over the targeted area. Pulses of energy cause fat cells to heat up and shrink, promoting skin contraction for a slimming and smoothing effect. There is no downtime with this treatment, allowing you to return to your normal activity following treatment. Patients will see significant improvement approximately 12 weeks following 1 truSculpt® 3D session. Additional sessions may be required to obtain desired results. View Aesthetician Amy Classen walk through a truSculpt 3D treatment in the video below. How many areas of the body can be treated with truSculpt 3D? truSculpt 3D is able to treat up to 4 areas of the body in one session. truSculpt 3D is designed to treat stubborn areas of the body where fat won’t budge, like the abdomen, thighs, buttocks, flanks, bra line and other problem areas. Patients with a BMI of 38 or less and who have stubborn pockets of fat that they would like to shed on different areas of the body are good candidates for truSculpt 3D. If you have metallic implants, a pacemaker, an internal defibrillator or joint replacements in the area you want to have treated, you cannot have the truSculpt 3D procedure. Pregnant women or women who are trying to get pregnant are also not able to have the procedure. With one truSculpt 3D treatment patients should see over 20% in fat reduction. Patients have the option to schedule more treatments after the first one, but they should be spaced out at least 6-8 weeks apart. During your consultation, Aesthetician Amy Classen will make recommendations on how many treatments you will need. The truSculpt 3D does not involve pain and there are very few side effects. When patients receive the truSculpt 3D treatment they normally feel a warm sensation. This sensation is not painful and is very tolerable. After the treatment, patients may experience mild irritation and redness, which gradually clears up. Patients report discomfort scores between 1-3 on a scale of 10. The truSculpt 3D procedure is non-surgical, so the patient is able to resume their daily activities without needing downtime. Some patients may have a moderate amount of discomfort, but they’re able to return to their work following the treatment. Although they are both non-invasive procedures that target and destroy specific fat cells that are naturally expelled through the body, truSculpt 3D uses radiofrequency technology to heat fat cells while CoolSculpting freezes fat cells for fat reduction and body contouring. Aesthetician Amy Classen can talk through the primary differences between these two procedures during your consultation. More questions? Call us at 360-738-3223.